Bhagavat : On another occasion, Prabhupada asked Satsvarupa Maharaja to get Tamal Krishna to come to the room. It was in the evening, and I was just coming back from downtown to give my report. As I was going to Prabhupada's room, I saw Satsvarupa Maharaja, and he said, "Have you seen Tamal Krishna Goswami?" I said, "No, I just came back from downtown." He said, "Okay." I went to Prabhupada's room. There were about four Life Members in the room with Prabhupada. Prabhupada said to me, "Come in and sit down." I said, "You're busy now, Prabhupada. I'll come back later." He said, "No, come in and sit down." I sat down in the corner. Then Tamal Krishna opened the door, and Prabhupada said, "Come in, sit down." He sat down. The two of us were sitting there for a half-hour or so while Prabhupada spoke to these Indian gentlemen. He didn't say a word to us. He was preaching. They all thanked Prabhupada, offered their obeisances, and walked out. 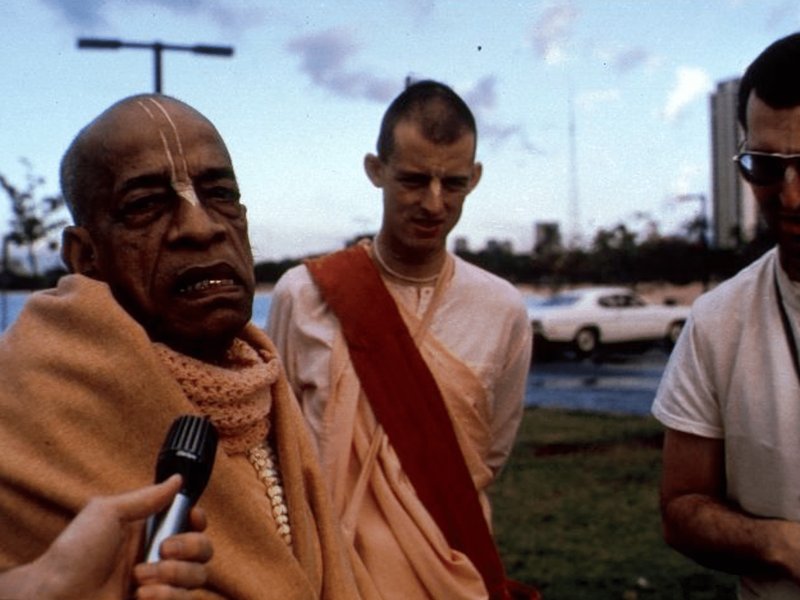 Prabhupada said to us, "If you do not listen to me preach, then how will you learn to preach? You must listen to me preach so that you learn the art of explaining this philosophy to important and wealthy men." Prabhupada was training us. It was a constant education. Head of the Hindu society came up on stage and garlanded Srila Prabhupada with dollar bills.